Search results for "set design"
Weiss/Manfredi is bringing an update to the U.S. Embassy in New Delhi, India. Yesterday, the New York–based firm released initial renderings of its redesign for the 28-acre site along with potential plans to restore the modernist Chancery Building, designed by Edward Durell Stone in 1958. The 61-year-old campus sits in New Delhi’s diplomatic enclave of Chanakyapuri, a verdant city built in the mid-19th century for wealthy locals and other embassies. 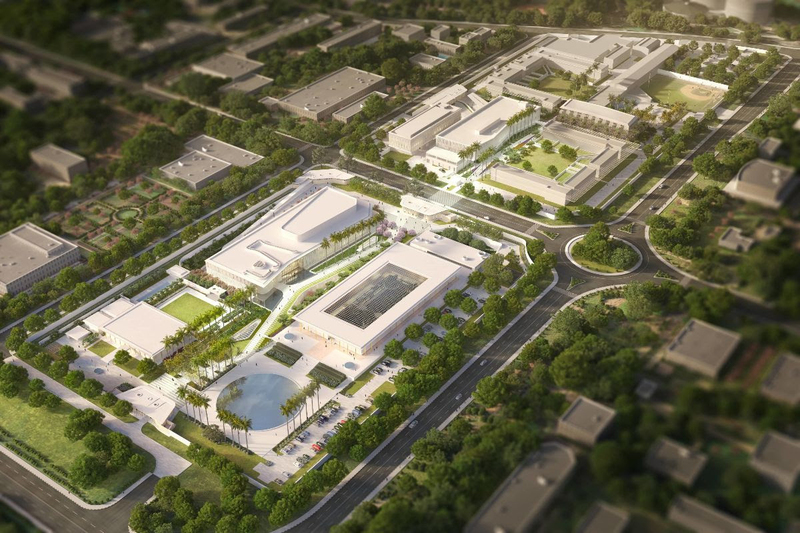 Using a long-term masterplan that hinges on security and an extensive, connective landscape, the design team will add new construction to the embassy’s property, including an office building for the ambassador and staff, as well as a support annex featuring space for more offices and a health unit. Five small entry pavilions will also be integrated at the edges of the campus as welcoming points for visitors. Weiss/Manfredi, the award-winning firm led by Marion Weiss and Michael Manfredi, has worked on the masterplan for the embassy since 2014. In collaboration with the State Department, the practice has come up with a design that both fits the functional needs of the U.S. government and honors India’s architectural heritage. According to the architects, the new construction will complement Indian vernacular architecture with materials that are used both locally and nationally, as well as with design motifs that evoke the ancient traditions of the country. For example, the new office building and support annex will be clad in interwoven pre-cast concrete fins featuring white Makrana marble. This design move serves as a nod to the jali (or perforated) screens used in Indian homes. Other common Indian stones such as Golden Teak sandstone, Kota limestone, and Ambaji white marble will also be used throughout the campus. Due to New Delhi’s hot and variable climate, each piece of architecture will feature some type of shading component or cover. The main office structure, which appears to have a slightly curved stone facade facing the chancery, will be topped with a deep, flat canopy roof. On the edge of the campus will be a giant reflecting pool, providing evaporative cooling for the surrounding structures. Garden walls, open green spaces, and shaded seating will be scattered throughout the public areas, while all functional zones will be connected via a tree-lined promenade that will extend to both sides of the campus. Initial construction on the support annex is expected to begin this spring. In total, the project is set to take seven to eight years to complete and will be built in two phases. On June 16, 2014, a tornado tore through the small agricultural community of Pilger, Nebraska, causing catastrophic damage to the village 85 miles northwest of Omaha. The tornado, one of two that hit Pilger on the same day, was part of a multi-day storm that produced more than 100 tornados across the Great Plains. The EF-4 grade storm generated winds of up to 200 miles an hour, left two people dead and sixteen critically injured, and caused the destruction of over half of the village’s buildings. As it spiraled its way from Pilger’s main street, the storm took out the clerk’s office, post office, a Lutheran church, a convenience store, and half of Pilger’s homes. Grain bins belonging to the local farmers’ co-op blew away, leaving behind mountains of soybeans and corn. The Wisner-Pilger Middle School, the only school in Pilger, also sustained heavy damage. Built in 1909, the school served K-12 students from the village until 1969, when the Pilger School District consolidated with the neighboring community of Wisner. At the time the storm hit, the Wisner-Pilger Middle School served approximately seventy-five 5th and 6th grade students, while an elementary-through-fourth grade school and a high school were located in Wisner, ten miles east. The condition of the school left the Wisner-Pilger Board of Education with contentious choices that weighed on both communities: rebuild the destroyed middle school; bring all three schools to a new building in Pilger; or combine all three schools on one campus in Wisner. 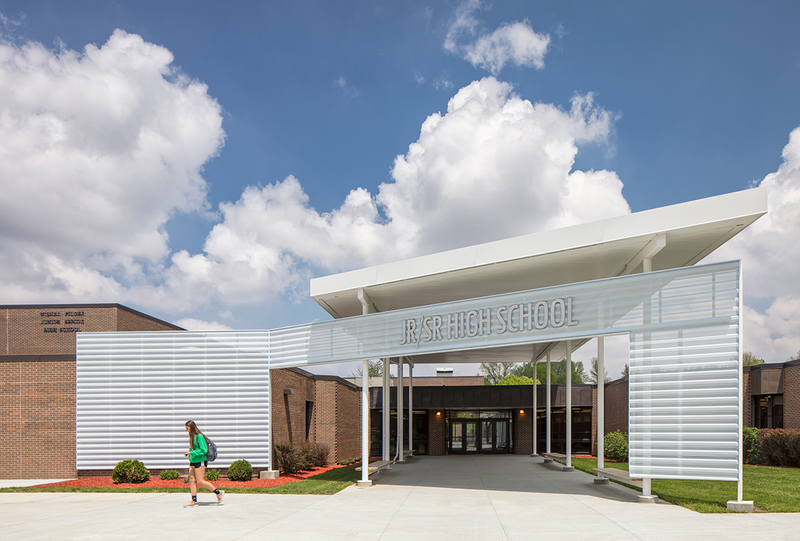 “Educationally, a single-site school was the best solution,” said Darin Hanigan, project coordinator at BVH Architecture, based in Lincoln, Nebraska. BVH visited Pilger within days of the tornado hitting to explore restoration of the 1909 Wisner-Pilger Middle School but found that the damage was too extensive to repair. The decision was made to create an addition to the high school in Wisner for pre-K through 6th grade. The new school needed to be an object of pride for both Wisner and Pilger. “Rural communities get a new building once every five years—if they are lucky” said Hanigan. “They want to make a statement.” For BVH, making a statement started from the inside out. This included omitting rooms that cater to only one use and taking a look at opportunities for the structure to complement the school’s unique educational model. In the school, students spend only 20 percent of their time in their assigned classrooms—the rest is spent in flexible, sometimes multiuse spaces; the commons, located just inside the school’s entrance, serves as a gathering place but also as a lunchroom. With all students learning under the same roof, grades are able to collaborate, creating more opportunities for students to learn at different levels, and spaces needed to accommodate that. Moving throughout the building, students pass through a tactile environment with ample room to display their work. Laser-cut metal panels with designs inspired by math, language, the solar system, and local topography adorn the school. Surfaces are kickable, trackable, writable, and often magnetic. Windows are carefully placed to support educational activities, with low windows located inside reading nooks, and high windows placed in resource spaces and hallways. High windows are kept away from teaching walls to minimize glare. Windows are arranged throughout the school to accommodate views at a range of heights, whether the students are walking through the school or seated at their desks. “Students spend their time inside versus outside, so that’s where the money should go,” Hanigan said. Spaces abound with diffuse light, courtesy of a cost-effective metal screening system. BVH Architecture remained ever-mindful of the destructive potential that precipitated the need for the new school. The roof system of the band room has a hollow core integrated into the precast wall, with the band room itself set inside the school’s center. The band room has the ability to shelter every student and educator on the campus if a tornado were to pass through again. In October 2018 SHoP Architects completed the first tower of the Essex Crossing mega-development. 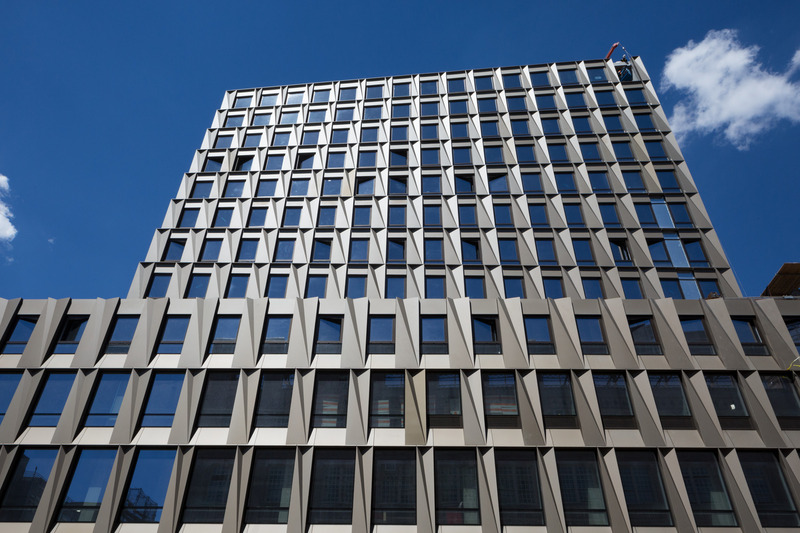 Located in Manhattan's Lower East Side, the 14-story mixed-use property is clad with anodized aluminum curtainwall modules. Essex Crossing is a sprawling 6-acre mixed-used development project master planned by SHoP. The site has largely lain dormant since the 1967 demolition of the working-class tenements located at the base of the Williamsburg Bridge. In total, the project will deliver approximately two million square feet of development. The podium of 242 Broome is primarily reserved for retail use, with large curtain wall modules and window widths to facilitate greater daylighting. To increase sidewalk width in front of the tower, the modules of the first five stories taper toward the building's base, each floor overhanging the one beneath by nearly one and a half feet. In a bid to blend with the preexisting massing of the neighborhood, the summit of the podium roughly meets the cornice line of surrounding classically-designed tenements. In accordance with zoning stipulations, the remainder of the tower steps back, forming a vertical rectangular volume rising from the center of the podium. Each successive floor is angled slightly to the west and set back again by nearly one and a half feet. Interior residential use is marked by tighter mullions, with window sizes reduced significantly until the uppermost floors. Just over 500 aluminum-and-glass curtainwall modules are distributed across the building's elevations. Behind the aluminum rainscreen modules, SHoP was able to insert a continuous waterproofing barrier. The facade was installed at a rate of one floor per week, with the entire enclosure system installed in approximately three months. "Anchors for the curtain wall are embedded in the concrete slabs, and serrated aluminum L-shapes attach to the anchors allowing for adjustability," said the design team. "Hooks are attached to the back of the curtainwall mullions which rest on the L-brackets." According to SHoP Architects, the design team relied on parametric design and digital workflows to develop the continually changing curtain wall panels and interior layouts. The color of the folded panels was achieved by bathing the aluminum panels in a coloration bath. Along Ludlow Street, the western elevation of the project, SHoP Architects is also designing the International Center of Photography's new home. The 40,000-square-foot space will be clad in perforated aluminum, cut, folded, and hung on a series of vertical rails. Could Newark, New Jersey, be the Northeast's next big tech hub? It already boasts the region's most advanced fiber-optic network and serves as home to digital giants like Audible.com, an Amazon company. No wonder it was a top contender for HQ2. Though it didn’t win the bid, one major project that’s been in planning for three years could raise the city’s status to the next level. An upcoming development in the heart of downtown Newark promises to be a vital, mixed-use community for innovative companies. Riverfront Square, envisioned by local firm Lotus Equity Group, will be built steps away from the Passaic River and feature up to 2.3 million square feet of office, residential, hospitality, cultural space, and more within the city’s burgeoning tech sector, the Broad Street Corridor. Lotus has tapped TEN Arquitectos, Michael Green Architecture, Minno & Wasko, and Practice for Architecture & Urbanism (PAU) to design individual buildings for the 12-acre site as part of a masterplan by PAU. Built out in seven phases, the project will sit atop the old Newark Bears baseball stadium, which will be demolished later this year to make way for the first housing structure, a curved linear building built over a five-story, mixed-used base clad in brick. Designed by PAU, the elongated structure will be set at the edge of Riverfront Square along the Essex Freeway. In an interview with AN in 2017, Vishaan Chakrabarti of PAU said the city lacks a "connective tissue" to link its many cultural and educational institutions together. Riverfront Square, he said, will be a sort of "renaissance for Newark" with a focus on tech. Initial renderings reveal the first four phases of construction, which will add 1,300 workforce housing units and half-a-million square-feet of commercial office space to the site. Phase 1 of construction is set to break ground this summer. 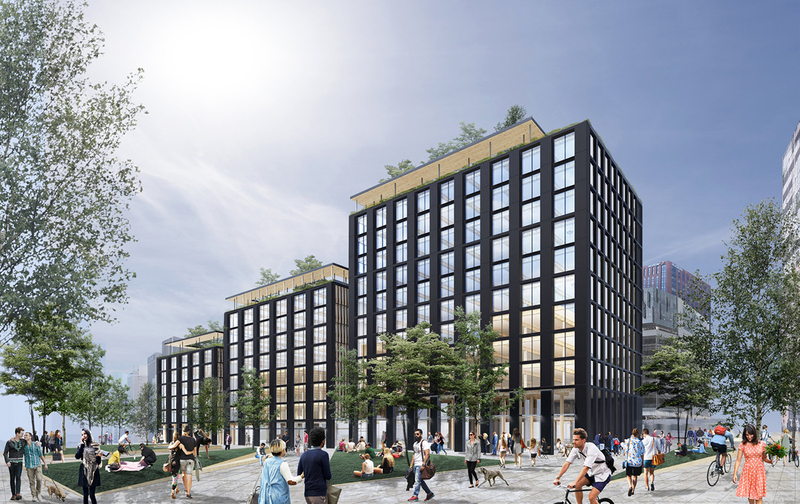 At the core of the development will be a mass timber building, touted as the tallest of its kind in the United States, by Vancouver architect Michael Green. The 12-story office structure appears in renderings to be three separate structures, but in reality, the building features a continuous floorplate connected by a full-height atrium. With 500,000 square feet of office space, it will also include ground floor retail, a café, and restaurants to help ignite what the developers want to become a 24/7 district. It will be built on the site’s southwestern corner. David Linehan, Lotus’s architect and development manager for Riverfront Square, said setting up a sustainable environment to benefit Newark (and lure people in) is a key component of the project, one that the city understands and is committed to backing. “It’s difficult to get newer products and ideas like using mass timber for large-scale projects through current codes, especially in New York,” he said. “For Newark, we’re working with the State of New Jersey to take a look at existing codes that allow timber to be used at this level. The city sees it as an opportunity to be at the forefront of what’s clearly going to be a major part of the future construction industry in the U.S.” During the second phase of construction, four rectangular towers will be raised at the southern edge of the site along Broad Street. Enrique Norten will design the buildings, which will be offset slightly from each other in order to maximize light, air, and views of New York’s skyline. They’re likely to feature a metal panel and glass facade. Mathews Nielsen Landscape Architects will provide a plan for the site's green spaces, which will turn a very urban, concrete area into a nature-filled leisure and cultural retreat for residents and local workers. The landscape will aim to increase downtown's connection to the adjacent Newark Riverfront Park, an on-going landscape development that received an award-winning initial design by Lee Weintraub in 2013. James Corner Field Operations is slated to create an additional 15 acres of space for the park in the coming years. The parking garage is a starkly utilitarian typology that has been an unlikely subject for some of the world's highest-profile architects; everyone from Frank Gehry to Herzog and de Meuron has tried their hands at a high-design car park. Now, New York–based computational design and digital fabrication studio MARC FORNES / THEVERYMANY has brought a designer parking garage to Charlotte, North Carolina, with Wanderwall, an exterior parkade wall of fluorescent aluminum. 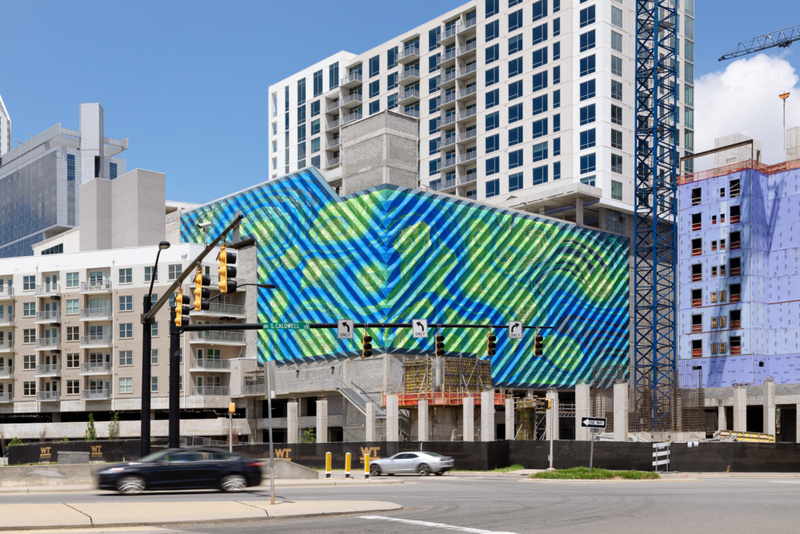 The blue-green aluminum screen spans eight stories; its pattern—reminiscent of Van Gogh's Starry Night—takes on a dreamy quality as it courses across the east and south elevations of the structure. According to MARC FORNES / THEVERMANY, the facade's design evokes Charlotte's status as the second largest financial center in the nation; the aluminum sheets are punctuated by a network of nodes strung together by a web of striations passing over waves of diagonal ridges. The thickness of the aluminum screen is 1/8 inch while the depth of the overall surface reaches up to 16 inches at certain moments. Light passing through nodes and striations of the facade, which is reminiscent of an Arabic mashrabiya window oriel with its complex geometrical latticework, casts varied shadow patterns on the otherwise drab interior concrete walls and flooring. Additionally, the folds of the aluminum reflect sunlight to create a glowing fog of light. Although composed of 5,768 individual aluminum pieces, the facade is draped over the structure as a continuous piece without the backing of a secondary structure and is attached directly to the main concrete structure. "There is no discrete secondary structure, but rather, the facade is a unified system which provides both structural depth, enclosure, and a graphic signal at the urban scale" said MARC FORNES / THEVERYMANY, "it is composed out of labyrinthine stripes, a continuous diagonal underlayer, and custom brackets—all made out of cut and folded aluminum. No one part works independently—only in collaboration with the other parts." The pattern of the facade emerges from the flow of dramatic colors through a rational grid. "The overall motif is derived from computational flows, captured at one moment in the simulation," said the design team. "Those resulting curves are approximated through sets of non-linear, labyrinthine stripes. Coloration is applied in relation to the 'viscosity' of the initial flows." While this is one of MARC FORNES / THEVERYMANY's larger projects, the design team noted that the scaling up of the ultra-thin aluminum system the firm has used in smaller projects was easier than anticipated. Lessons learned from past permanent projects—such as engineering techniques and workflows—serving as an effective guide. Marc Fornes will be presenting a detailed dive into Wanderwall at Facades+ Charlotte on March 19. A new exhibition by New York–based artist Leslie Wayne explores everyday spaces and how, through alternative modes of representation, we can see those environments in a deeper light. What’s Inside, now on view at New York City's Jack Shainman Gallery through March 30, features Wayne’s newest collection of paintings that detail basic domestic scenes like messy closets, busy bookshelves, and broken windows. These disheveled objects evoke a German Expressionist perspective, according to the artist, and unveil Wayne’s political and personal anxieties through singular depictions of an inner world that’s “not quite right,” but can be fixed. AN spoke with Wayne via email about the layered inspiration behind What’s Inside, and how color, both in architecture and in painting, can manipulate the emotions of its viewers. She also explains why studying art that highlights buildings or interior design can ultimately strengthen a person’s appreciation for the built environment. The Architect's Newspaper: Your current collection seems to build off your previous window pieces for Free Experience. Can you explain why you decided to continue that project and how this show takes those previous themes to another level? Leslie Wayne: As an abstract artist, my whole career, I’ve been wanting to bring representation into my work, but I didn’t quite know how it would manifest itself given the idiosyncratic way I use paint. Those first window paintings gave me a way to do that. Conceptually, they allowed me to express my feelings and ideas about the world around me, about the current state of affairs, as well as my own personal life, by using domestic architectural forms as a motif and as a kind of organizing principle. I realized that my abstract paintings always kept you on a threshold—of what was visible, and what was beneath and behind the surface that you could never quite completely see or understand. Architectural thresholds can operate in much the same way. By making a painting of a doorway that is just barely cracked open, or a window that is boarded up, I’m keeping you on that threshold. So actually, I’m still exploring the same thing, only in a more pictorial way. AN: Why did you choose to focus on normal interior objects and spaces? What draws you to imagining these details in a new way? LW: I’m drawing largely on my immediate surroundings—the armoire in my bedroom, the tool chest in my husband’s studio, and my bookshelves. While the forms as furniture are universal, their contents are autobiographical, and they tell you a lot about what makes up my life. In the beginning, the idea of creating a painting of a closet was just a response to my need to move on from an earlier body of work. But then the idea of closets became more interesting to me as types of containers. Containers, not just of clothing and everyday objects, but of things we hold dear, or secrets we want to keep. And then came the paintings of drawers and bookshelves, containers that hold evidence of your life—books you’ve read, music you listen to, materials you use for work, etc. And on a purely formal level, closets, shelves, and window frames provide an interesting platform for different kinds of architectural motifs, which as a painter is great because it’s just an endless source of visual information. AN: Your work is very colorful and tactile. What do the different colors and the way those hues bring a tangible quality to your paintings say about these mundane architectural spaces you depict? LW: Color is loaded with emotive power, much the same way that music is. It can be used to express tremendously strong feelings, but, because of that, you’re in danger of being manipulative and clichéd if you go too far. It’s tricky. You want to seduce the viewer but not knock them over the head with it! Most people, when they’re thinking about architecture they’re thinking about the facade and the overall shape of a building or an architectural detail. They’re not considering the way in which a building is a container and a shelter and how the design and the color of an interior space can determine the way you feel when you go inside of it. We were in Mexico City recently and went to the house of Luis Barragán. It was very interesting to see how he used color to visually block out certain spaces and establish an overall feeling of a room. Yellow walls made you feel warm and welcomed, pink walls gave you a sensation of joy and anticipation. I loved that. For me, when I’m painting, I try to use color to do much the same thing, to convey a sensation. AN: Why is it valuable to look at architecture and interiors through the alternative lenses of painting or photography, rather than being in the space itself? LW: I would say that it’s valuable to look at architecture and interiors through the alternative lenses of painting or photography in addition to being in the space itself. There’s no substitute for having a direct experience of an architectural space. But I think we take those spaces for granted. And those of us in dense urban environments usually have our heads down (or buried in our cell phones!) when we’re walking rather than looking up and noticing what tremendously rich details are on buildings all around us. It’s valuable to reconsider what those spaces mean to us and art can take you there through the poetry of metaphor and illusion. If you’ve ever been taken by a Fra Angelico painting for example, like The Annunciation, then perhaps next time you’re inside a space that has vaulted ceilings you’ll be reminded of the painting and become aware of the ceiling’s elegance and structural integrity. Or a Dorothea Lange photograph of a young sharecropper’s log cabin can make you really feel what it must mean to live in a structure of such simplicity. Bernd and Hilla Becher spent their lives documenting industrial architecture and brought the simplest most overlooked structures, like water towers, into the realm of the sublime. We look at these things every day, but art helps us see them more deeply. See Wayne’s new show, What’s Inside, at the Jack Shainman Gallery at 513 West 20th Street, New York, New York. Design kitchens that respond in real time with new digital appliances and plumbing. With the help of smart home systems like Alexa and Google Home, the following appliances and electronics make the kitchen more responsive and powerful than ever. 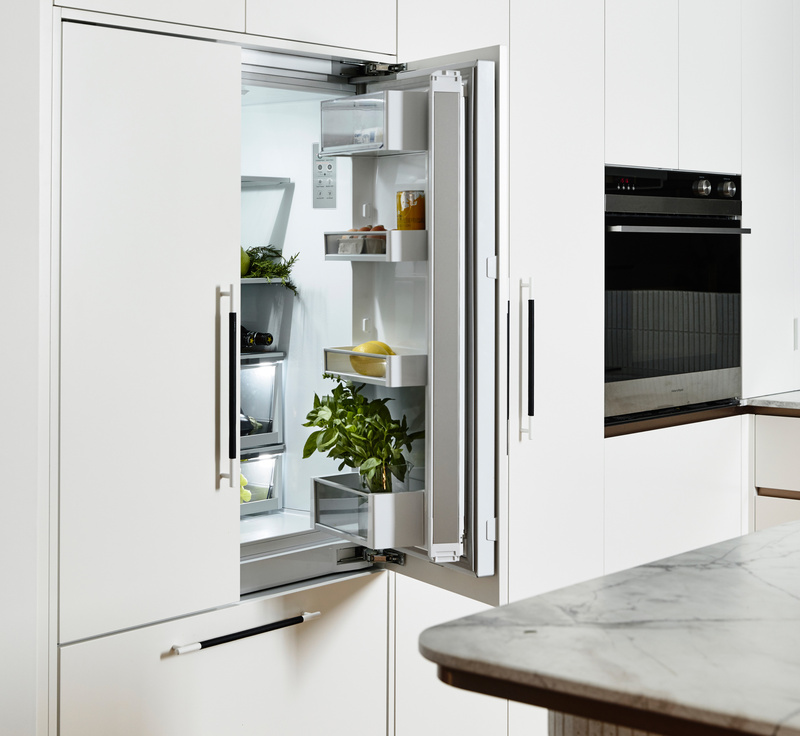 Integrated Column Freezer and Refrigerator Fisher & Paykel Fisher & Paykel’s new family-size column freezer and refrigerator can be installed separately or together, and can be variably configured. The ideal temperature is set for three food zones: freeze, -7 degrees Fahrenheit to 7 degrees Fahrenheit; soft freeze, 14 degrees Fahrenheit to 18 degrees Fahrenheit; and deep freeze, -13 degrees Fahrenheit. Smart Oven+ Kitchenaid Smart Oven+ is designed with interchangeable cooking attachments that plug directly into a hub inside. Including a grill, steamer, baking stone, and base heating pan, the oven also has an LED illuminated touch screen that directs the user to the right attachment to employ based on cooking instructions in the platform. TKO Touch Faucet Lenova Sinks Grubby hands? Tap and wash with a faucet that turns on with a touch of your wrist or forearm. Don’t worry about burning yourself; LED lights will indicate the temperature. And, when you’re through, integrated sensors will automatically shut off the flow. 48-Inch Pro-Harmony Standard Depth Gas Range Thermador Pro-Harmony comes equipped with Thermador’s new app that pairs the oven with other appliances like the ventilation hood, as well as digital recipes that sync with automatic settings. For easy cleanup, the stovetop features a base where a hand and sponge can easily fit under each burner. Look ma, no hands! Open the cabinet door by stepping on a sensor or tapping a button. Special features such as under-mount lighting are customizable with the Auto Opener app. 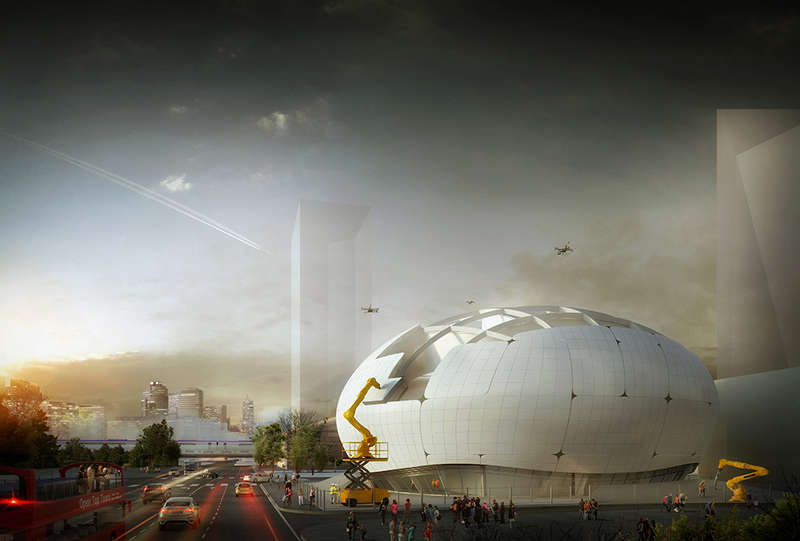 The soon-to-be-built Robot Science Museum in Seoul, South Korea, will be a robotics exhibition itself. The museum, to be designed by Turkish firm Melike Altınışık Architects (MAA), will be built by robots when construction begins next year. In this way, the construction of the building itself will be the museum’s “first exhibition,” according to principal Melike Altınışık, whose firm is already known for distinctively sci-fi buildings like the 882-foot Küçük Çamlıca TV and Radio Tower, which is currently under construction in Istanbul. The ovoid form of the museum, which will display a range of technologies, including artificial intelligence, virtual reality, augmented reality, and holograms, is designed to create a set of “non-directional” relationships both within the interiors, but also in the public space and the street that surrounds it. The intent is to shift relationships for foot and vehicle traffic and create a more ambiguous flow between inside and out. The entire architectural and visual language of the museum is intended to showcase the museum’s own mission to educate the public on science and technology by using cutting-edge materials and high-tech fabrication techniques, including robotic construction. While the specifics of the robot technology to be used will be announced later this spring, the current plan is to use one “team” of robots to construct the curved metal facade, completing all steps from shaping to assembly to welding and polishing. An additional team of robots will 3-D print concrete, primarily for the spaces surrounding the museum. Both will be directed by BIM systems and help the building itself “manifest robots, science, technology, and innovation,” according to MAA. The museum was commissioned by the Seoul Metropolitan Government and will operate as part of the Seoul Metropolitan Museums with plans to open in full in 2022. It will form part of the Changbai New Economic Center in Seoul’s Chang-dong neighborhood as part of a new cultural center. Missed some of this week’s architecture news, or our tweets and Facebook posts from the last few days? Don’t sweat it—we’ve gathered the week’s must-read stories right here. Enjoy! 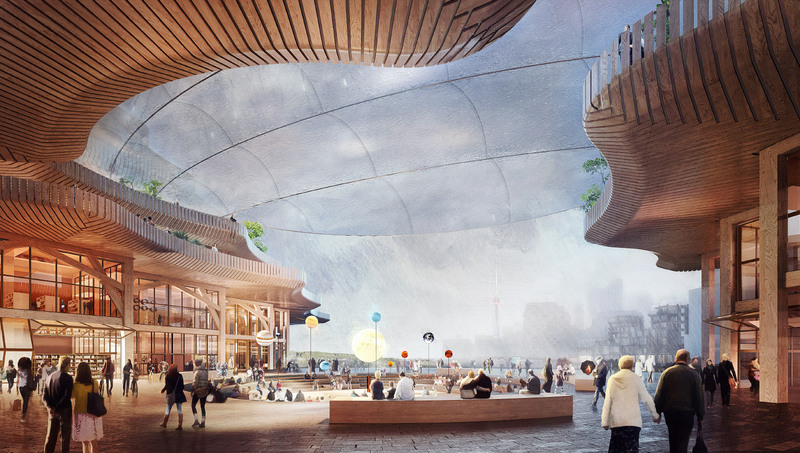 Sidewalk Labs reveals Snøhetta and Heatherwick designs for its Toronto development Design and funding details for Sidewalk Labs' wholesale "smart" neighborhood on the Toronto waterfront continue to trickle out. Extreme architecture: The great lengths (and heights) of high design High-minded design can only be realized through extreme construction. AN focuses on three recent projects that demonstrate the lengths that must be gone to. Drawing Codes ironically gets the rules all wrong Jaffer Kolb reviews Drawing Codes: Experimental Protocols of Architectural Representation, Volume II on view at the Cooper Union. Andrés Jaque, David Adjaye, and others paint a bleak vision of tomorrow in London On show at the Whitechapel Gallery in London, Is This Tomorrow? offers a mixed bag of installations that propose a dismal and bleak future. First phase of Hudson Yards set to finally open to the public The first phase of Hudson Yards opens to the public on March 15, and we rounded up the buildings that are set to be finished soon. 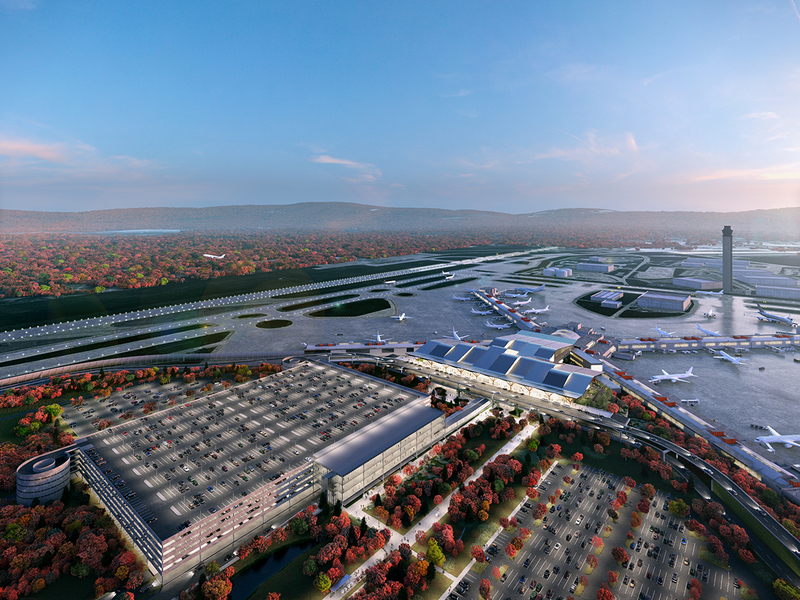 Spanish firm luis vidal + architects (LVA) has partnered with Gensler and OJB Landscape Architecture to design an addition to the Pittsburgh International Airport in western Pennsylvania. Initial renderings released Wednesday of the $1.1 billion project showcase the new terminal set to open in 2023. According to the architects, the design combines nature, technology, and community (a philosophy branded by the airport as NaTeCo) as a nod to Pittsburgh’s location, its local residents, and their commitment to innovation. The design team studied the city’s landscape to come up with a vision that evokes its iconic rolling hills and the rivers that run through it. The new terminal, built between Concourses C and D, will feature an undulating roof, designed to bring pockets of light into the public spaces below. Warm timber and ample plantings will be used throughout the interior as a nod to the region’s natural surroundings. “The combination of nature, technology, and community form the DNA of the region,” said Luis Vidal, “and that should be reflected in the structure of the building to enhance the experience for all users and leave a memorable impression.” In an interview with the airport’s news service, Blue Sky PIT, Vidal noted his initial trips to the city helped him understand how these physical elements could be integrated to create an adaptable design for the 21st-century that was truly Pittsburgh-centric. “When you look at Pittsburgh, you can see it has a very strong heritage and that it has undergone a huge transformation to embrace a diversification of industries, including medicine, education, technology, and robotics,” he said. “Those elements of nature, technology, and community grabbed me during a number of visits and very quickly, I understood that it was the DNA of the region.” Vidal and Gensler’s concept centers around a new, 51-gate terminal that will include a modern check-in concourse, an expanded TSA checkpoint, as well as indoor and outdoor green plazas and gathering spaces. The design will help improve wayfinding and circulation from the departing and arrival zones, while also decreasing walking distances between those areas. HDR, an engineering consultancy based out of Omaha, Nebraska, will help plan for future technological advancements within the airport and seek room for new automated systems. Gensler’s Principal and Aviation Leader Ty Osbaugh said the first set of renderings are the result of a huge community engagement process, which will continue through the schematic design phase. “We have worked very hard, and will continue working to further refine this concept that draws on the best features of the region,” Osbaugh said. “This concept allows for a more modern, adaptable facility that will truly reflect and belong to Pittsburgh.” This isn’t the first major upgrade the Pittsburgh International Aiport has received. In 1992, a billion-dollar expansion by architect Tasso Katselas Associates received widespread praise, particularly for the addition of the airport’s then-new Airside Terminal. The large space featured an arched ceiling and ample room dedicated to a shopping district known as the Airmall. That design helped simplify aircraft movement and eased pedestrian traffic, later becoming a global model for efficient aviation architecture. The architects hope to build on the Airside Terminal’s legacy by building a modern structure that consolidates the airport’s landside and airside operations into one place. The project, with its sweeping design and light-filled interior, evokes Vidal’s award-winning 2014 design of Terminal 2 at London’s Heathrow Airport. 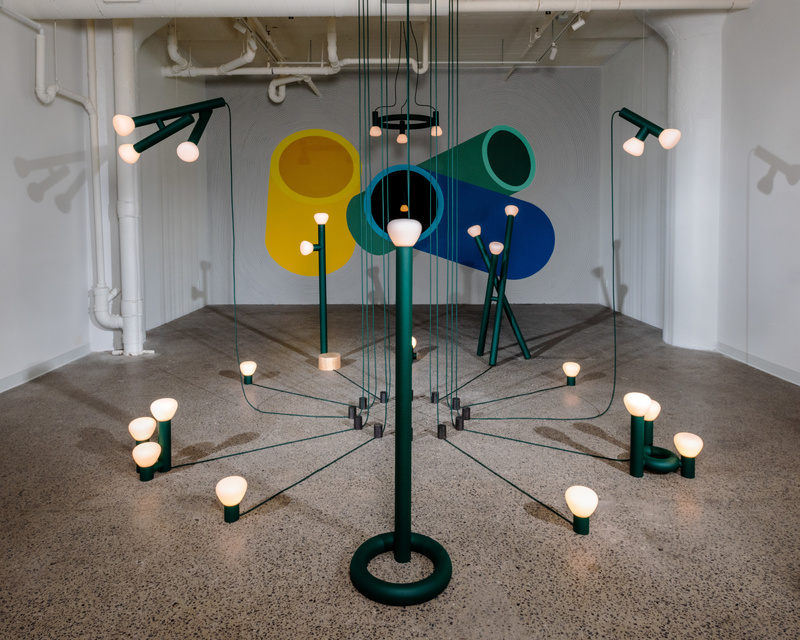 Young Montreal lighting brand Lambert & Fils has gained recognition in the past few years with a series of blockbuster lighting collections that have broken away from the norms that have stagnated the lighting industry in the past few years. Notable designs include the airport-inspired Dorval series, developed with French studio SCMP. The boutique design house has also developed a series of lauded private and retail interiors. Building on this success, Lambert & Fils has just opened a new exhibition annex adjacent to its office and workshop. Located in the heart of Montreal, Corridor promises to become a new space for cultural exchange. The gallery will feature art and design, and will explore where these often-siloed disciplines intersect. To launch the new space, Lambert & Fils tapped Swiss designer Adrien Rovero to create a special, temporary installation. The Feu de Camp mise-en-scene draws inspiration from Rovero's short time in the boy scouts but also from Montreal’s long and cold winters. The installation incorporates various geometric forms, flashlight-inspired fixtures, and simple industrial materials—green tubes, elastics, electrical wires, and semi-spherical glass diffusers—loosely in the form of a campfire as a way to bring people together during the dreary late-winter season. The installation is arranged around a central node with 12 low-lying lamps surrounding in a circle. These elements were used sparingly to compose a playful yet technically-refined setup, and Rovero also created a wall mural that illustrates this peculiar typology in his unique assemblage-inspired aesthetic. Though this inaugural installation closes tomorrow, Corridor will open the new Studio Edition exhibition—a group show featuring work by emerging Canadian designers—in the coming months. Upon entering Drawing Codes, you might be struck by a sense of familiarity, as though everything looks somehow as it should. It’s comforting to be surrounded by beautiful drawings hung neatly in well-spaced, black-framed squares, little perfect windows into a collection of works by a close-knit circle of designers. But there’s also something unsettling in the comfort and familiarity of the exhibition—closing at the Cooper Union on February 23 and formally titled Drawing Codes: Experimental Protocols of Architectural Representation, Volume II—as though we are being sold something too slick, too friendly, too complete, as though everything’s been face-tuned, flattened into a collection that articulates a narrative without agonism or a predetermined history without contestation. The show’s brief itself leaves its subject quite open. In their introductory text, curators Andrew Kudless and Adam Marcus outline four prompts to consider the theme: code as generative constraint, code as language, code as cipher, and code as script. “Code” might encompass building regulations and energy standards, syntax and encryption, recipes and typologies. But an assumption underlies the brief that the project is really about computational code; the curators’ text opens with a comment explaining that emergent technologies have changed how we practice. This internal conflict of the theme—between its presumed meaning and purported openness—produces a collection that commits to neither. And while the curators’ prompt cleaves “code” open, Kudless and Marcus restrict the content through their own rules: square format, black and white drawings, only orthographic projection. These rules reference early digital aesthetics and we need look no further than to the Whitney’s concurrent show Programmed: Rules, Codes, and Choreographies in Art, 1965-2018 to see evidence of that history. There, works like Joan Truckenbrod’s 1975 Coded Algorithmic Drawing (#45), Manfred Mohr’s Band Structures studies from the 1960s-’70s, and Frederick Hammersley’s No Title (1969) lay out a coding style that persists in contemporary practice, as seen in that same show in works by Tauba Auerbach, Casey Reas, and Alex Dodge among others. 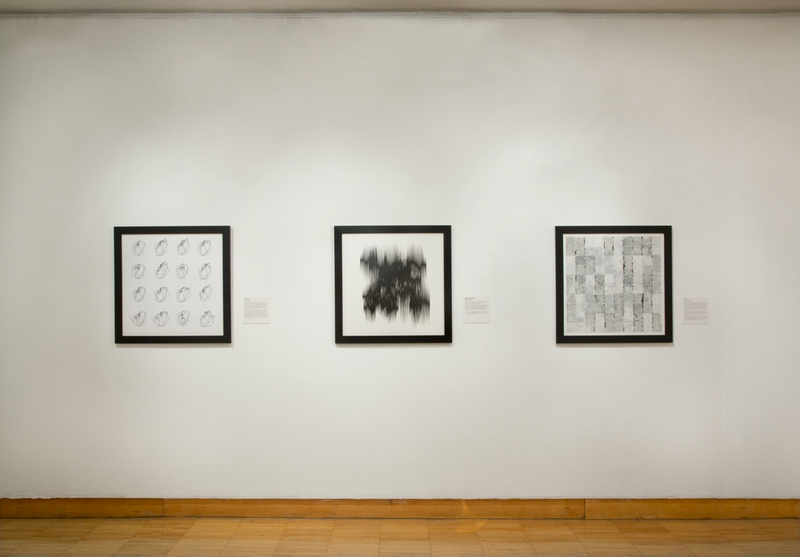 By and large, the drawings in Drawing Codes are individually impressive and conceptually rich. They are beautiful and obtuse, like Projectors by MILLIØNS or Anomalous Corner by Studio Sean Canty or DoubleVision by IwamotoScott Architecture; they are funny and smart, like Another Circle GPS Plan by Aranda\Lasch or Twisted Concrete Codes by Tsz Yan Ng with Mehrdad Hadighi; they are unexpected, like Stephanie Lin’s Accumulated Error No. 41, which uses coding to explore the blurry boundaries between rendering and drawing through visual effect. Each of the drawings could be described individually, and each has a novel take on the brief—they display a range of talented designers who should be lauded for their work—but together, they become muddled into a quasi-similar set of too-tasteful objects that don’t illustrate the potential of the topic. They seem forced into a mold rather than freed to explore new territories. 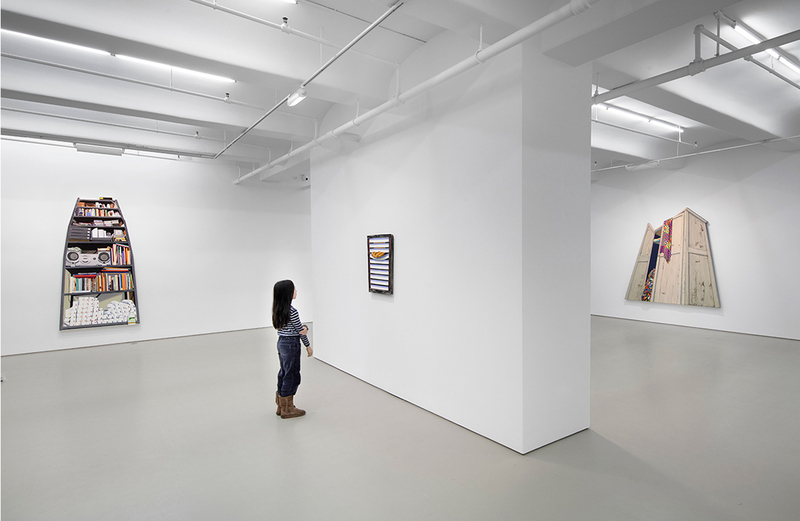 The show’s restrictions put the content into a curious double-bind: individual artist statements offer a posteriori rationalizations designed to satisfy the brief, while the brief itself seems built around a priori ideas about what a show about code (or drawing) might look like. For example, that the curators eradicated perspective (in order to ensure participants wouldn’t send renderings) precludes a reading of “perspective” as itself coded, rule-based, and programmable. It also means that some of the most exciting work in computation around deep learning, neural networks, and artificial intelligence, built around interrogating and constructing perspective,are off the table here. The rules of the exhibition are curiously conservative given the topic and are too aligned with a trend towards early computer graphics popular across schools and young offices today. The statements also draw attention to how responding to the brief becomes more rhetorical than generative. Together, the works read as a compilation of exceptions that demonstrate how adept we all are at bending a brief to our work. This makes it more difficult to identify dominant narratives or sub-narratives across drawings, less compelling as a portrait of code, and privileges the individuality of the authors over the ethos of the collective. And this collective is producing a tremendous amount right now. Many, if not most of the participants in the show (and in its first volume, which debuted at the California College of Arts in January, 2017) are part of an emerging generation of practices (in which my own studio is often a part) that often cohabitate in exhibitions, publications, biennials, and conferences. These platforms should be pushing us all to do better, to produce more critically, to learn from each other. The idea of this show is great. Its constraints, however, produce a condition where expectation limits the possibility of discovery or invention across the work. The show seems dedicated to reiterating things we already know about drawing, code, and each other, and rejects the ugliness of experimentation. Which made it nice to see V. Mitch McEwen’s Arduino Bot Print and Maria Yablonina’s The perpetual spline machine, both of which foregrounded haptic process over graphic order. The former, through producing a map of avoidance as the penguinbot tried to avoid retracing its steps on paper; the latter, through the creation of a solar-powered bending machine that produces splines as it collects whatever energy it can, like some tragic figure of a near-future Greek myth. In these cases, the format enabled and helped frame the works, which indicates the productive potential latent in the project. Ultimately the comfort of the show—its sanctioned and familiar take on the aesthetics of code, its politeness over an inclusive brief—is its greatest limitation. In the exhibition press release, the curators say that they want to explore the impact of “computation and code-based processes” on “conventions of architectural representation,” a clear, straightforward proposal for an exhibition that would be great to see. Without the exceptions, without the rules, and with a more open and inclusive attitude towards aesthetics not bound by known tropes but encouraged through expansive definitions of generative practice. Comfort, for all its comfort, is too safe to compel.